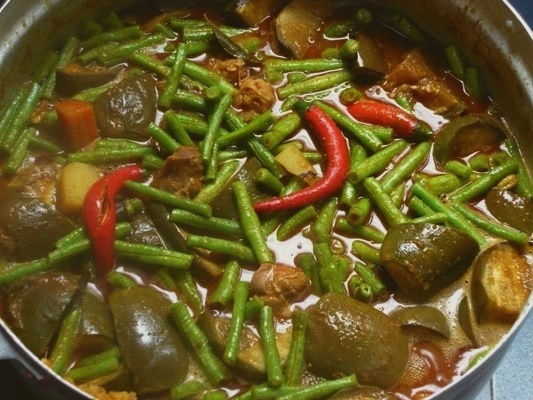 Dalca is a stewed vegetable curry with lentils (Dalca Sayur in Malay) which is famously served with Briyani Rice,Tomato Rice or Nasi Minyak; normaly cooked during special occasions and it is also a staple dish for a Malay wedding lunch menu. Dalca is cooked in curry lentils, tamarind (asam) fruit juice and mixed vegetables. Everyone has their own interpretation for Dalca. Mutton bones or beef is sometimes added to enhance the flavour for this dish. In a pot, heat the oil, throw in curry leaves and fry the onions, garlic and ginger with the spices until fragrant. When the onions turned brown, add in meat curry paste and stir until the oil is set to reddish brown. Reduce heat and continue to stir. Dissolve the tamarind in a little water and discard the pulp. Get ready for use. Add in 2-3 litres of water, tamarind juice and the soft lentils. Stir. Increase heat. Let boil. When the curry starts to boil, add in carrots and cubed potato and let it cooked till soft. Stir. Add in eggplants, longbeans and let it simmer for about 5-8 mins. Finally, add in tomato wedges and sliced red and green chillies. Add salt to taste and simmer for another 10 mins. Serve hot with Briyani rice or pratha bread. Happy trying! many thanks for this dalca recipe! great dish to eat with prata. this dish goes well with mutton innards! simmer the innards for at least 2 hours to make the broth and follow the recipe as recommended. sure to kick ur taste bud! It seemed rather a lot when I tried this recipe, so decided to use only 1/10 of the amount recommended.